The Abaddonian Ocean is the largest of the three primary equatorial oceans of Sinai, the other two being the Sea of the Pale and the Stygian Sea. The Abaddonian Ocean is located between the continents of Lamu and Ur. It is not generally traversed by airship or naval vessel, as there are not many stops along the way (natural or artificial) where a vessel could stop to replenish supplies, and Rephidim does not often traverse this ocean. There may be as-yet undiscovered islands in this ocean. Abaddon is the name of the red planet, the fifth planet from the sun, and a neighbor of Sinai. It is associated with war and also with the element of Fire, and hence is very important to the Sphere of Fire of the College Esoterica. Abaddon has a single moon, Sheol, which is as red as it is. For a long time, Abaddon was believed to be lifeless and cold, covered with rusty sands, and criss-crossed with strange "canals". There are many areas on the surface with active volcanos, bubbling hot springs, and vents that let noxious vapors seep into the atmosphere. The truth is that Abaddon is indeed capable of sustaining life, though not as well as Sinai by any means. At least in one area of Abaddon, there are several scattered colonies of races that parallel many prominent on Sinai, living in artificial "Life Domes", and with a higher level of technology that allows them the use of machines that would not be considered possible -- or safe -- on Sinai. The canals do indeed hold water and vegetation, but also are infested by disease and hostile creatures (such as the "Rotbiter") that make them far too dangerous to utilize by most. In recent history (during the first year of the reign of Tahir Archelaus the First), a (relatively) small chunk of the Himar region (including the city of Elamoore) was transplanted by some sort of Exile technology onto Abaddon, resulting in the fertile "Pit of Himar" that may some day be the site of the largest Life Dome of all. Already, the combined efforts of several tribes on Abaddon have resulted in the Pit of Himar being spanned by a massive framework, slowly being covered against the inhospitable elements, and fitted with environmental controls. Abaddon is very rich in metals, and Abaddonian iron is a popular commodity on metal-scarce Sinai. Abaddonian metal that has recently been brought to Sinai is known to have magic-resistant properties, though it has been observed that this slowly degrades as the metal "acclimates" to Sinai. This phenomenon does not seem to apply to all metal brought in from other worlds, though it is still very common - It is well known that meteoric iron has certain anti-magic properties, after all. Access to the world of Abaddon is provided by an ancient Sifran structure known as the Gateway Tower. The Gateway Tower on Abaddon is within the domain of the human-dominated Kampfzengruppe, allied with the Khattan Emirate for its control. "Abaddon" is also the name of the God of War, Fire and Destruction in the Olympian mythos. While Abu Dhabi has its share of slums and places badly in need of repair like most every other city, it sports some very impressive architecture and public gardens -- testaments to the wealth and feats of engineering of the city. It is a city of high-rising towers topped with minarets, and of bold colors found in stone mosaics. It is also well-fortified, to defend against occasional assaults by the bolder (or less intelligent) pirate raiders. Its primary exports are exotic spices and fine silks. It is rumored that, somewhere underneath the city, there lies a large underground "garden" that matches or exceeds the splendor of the gardens to be found above. It is also rumored that some bands of pirates find harbor here, with surreptitious sanction by city leaders. Aelfhem is a mountainous, forested region on the continent of Ur, south of Ashdod, and near Shabar. It is filled with exotic fauna and flora that give it a colorful and beautiful appearance ... but is also full of many dangers as well. It is especially noteworthy for its forests of pink- leaved trees, and for the diminutive Aelfin that live in huts amongst them. The capitol of Aelfhem is Winterhome, a settlement of modest size that lies in a valley beneath the Sacred Orchards, where groves of sugarfir trees are ritually tended by an order of Aelfin monks. In addition to the Aelfin, there are also small settlements of Eeee (migrated from Ashdod long ago) to be found in the area, and in recent years there have been sightings of three-headed dragons - In fact, it's rumored that the monks of the Sacred Orchard have one serving as a guardian of their holy ground. In legend, from times when Aelfhem was out of contact with the outside world, Aelfhem was held to be a place of magic, highly regarded for its craftsmanship of magical artifacts. However, if such was the case, it is an art that has been lost long ago, for Aelfin products - while reasonably sturdy and well-made - are fairly plain and modest, and certainly not possessed of any magical properties. An ancient island-nation, now considered a lost civilization, off the southern coast of the continent of Ur, and believed to be mostly covered by a Forbidden Zone (one which some scholars have theorized may have actually expanded to cover the entirety of this large island). Little is known for sure about the Aeztepans, although obscure legends and more recent research indicate that they were a race of spotted felines, bearing some superficial resemblance to Terran creatures known as "jaguars". The language persists in scholarly circles only in its written, hieroglyphic form. However, "secrets of Aeztepa" are often invoked in mystical and less-reputable magical circles, as it is often believed that these ancient peoples held some sort of great secrets ... though those same secrets supposedly turned their land into what it is now known as the Land of the Dead. The whole island is considered quarantine under authority of both Rephidim and of Babel, and travellers give it a wide berth, especially since freak storms have a tendency to pop up in the area. Ai is the name of one of the three major continents of Sinai. On this land mass can be found a wide range of climes and terrains, and it includes the territories of Himar, Himaat, Nordika and the Savan. A marshy area in the Half Valley area on the Levitha Peninsula on the continent of Ai. The Akwavi people (otter-morphs) have taken to this watery place very well. The Sanctuary of Amber is a monastery built for use by the Order of the Bounded Star and Anchor, situated in the Forbidden Zone of Shabar. The structure itself is suspended amongst several stone "needles" that characterize this strange region, and is of unknown age or means of construction. It is believed that the structure is actually built upon a "natural" formation (possibly a relic of the Sifras). The Sanctuary of Amber is noteworthy for its central chamber, in which it is believed that certain well-tuned minds may, from time to time, receive visions of possible futures -- particularly disasters to be hopefully averted with the warning given. On Ring Day, 6103 RTR, Shabar declared its independence from Rephidim, having formerly been a protectorate. Thus, the Sanctuary of Amber (also known as just "Amber") is recognized as the capitol of Shabar. The Annis School for Respectable Ladies is the largest and best example of its kind, a fair sample of several schools of its kind to be found in the nation of Gallis (in the Nordika Region on Ai), located in the capitol city of Fauxpas. The student body consists largely of "purebred" (Gallee) females who do not fit the profile for their breed. Usually this means that they conform poorly to the standards of their breeds � a doberman without a deep enough chest, a poodle whose muzzle is too wide or ears too short, and other such flaws suggesting an unfortunate roll on the genetic dice, not an actual mutt. Clear mutts (Gallah) are few but do occur, though even the ones with the most dubious claims to "pure breeding" usually claim it anyway. Whether they are of dubious ancestry or just unlucky, none of the school's students are considered to have good marriage prospects. The institution therefore seeks to train them for "respectable" but unimportant careers as tutors, clerks, accountants, secretaries, and the like. It emphasizes values, discipline, manners, and study. Arcadia is the seventh planet from the sun, and an especially colorful sight to those few who have powerful (and rare) telescopic equipment, for its surface and its rings display a rainbow of color. It is associated with life and healing, and hence is of special importance to the Sphere of Life of the College Esoterica. Since the advent of exploration of the worlds of the Primus System made possible by the Gateway Towers, Arcadia has been explored and found to be richly vegetated, and populated by a variant species of Hooka. Scouts report that most everything on Arcadia is "alive" ... Amorphous aquatic creatures have been mistaken for "living water", and tree-like beings have exhibited limited mobility and apparent intelligence. A fortification has been set up by explorers, under the shared authority of the Kampfzengruppe and the Khattan Emirate, and there is also a Savanite settlement located close to the Gateway Tower. 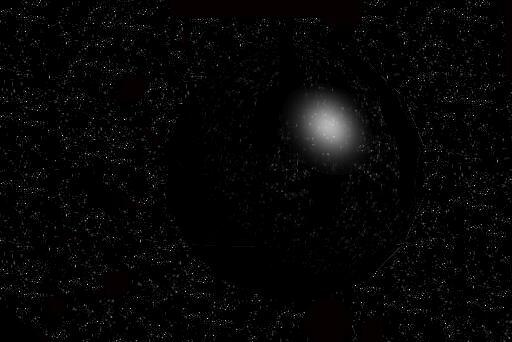 Ariel is the planet closest to the sun in the solar system of which Sinai is a part, and appears to be white and ghostly (with the help of rare telescopic equipment). It is associated with the realm of Spirit and is hence of special importance to the Sphere of Spirit of the College Esoterica. Although there is a Gateway Tower that provides access to Ariel, it is still largely unexplored, and considered to be fairly inhospitable. Ariel is also the name of a goddess of the Olympian Pantheon, appropriately associated with the spirit world. She is depicted as a young, pre-teen, white-furred Kattha with black hair. 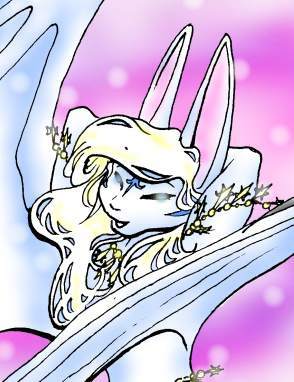 She is regarded as the "trickster goddess" of the Olympia mythos, though of a more benevolent nature than most. She is also cast in the role of Messenger of the Gods, and is often sought in the hopes of conveying messages to (or from) spirits in the afterlife. The Ashdod Territories cover a mostly mountainous, forested region on the continent of Ur. Its eastern edge is the best defined, bordered by ocean, while its southern tip ends at the Gigi Coast, and it touches Aelfhem to the southwest, Zahirinee to the south, and the Forbidden Land of Shabar and the territory of Saskanar toward the west. While Ashdod is recognized as a nation by some, it has fallen into nearly ceaseless cycles of civil war and infighting between various city-states that comprise its primary population centers. Ashdod, with its mountains, forests and caves, has the highest concentration of the bat-like Eeee on Sinai, and is considered to be their "homeland". Ashdod's traditional capitol is the grand city of Babel, though actual governing power has been wrested from it and gained back several times over. The ruler of Ashdod was long known as the Sabaoth, and was believed to be immortal and several thousand years old. The Sabaoth, however, proved to be not quite so immortal, and was succeeded by his son, Boghaz bar Sabaoth. The tradition of Babel being ruled by the Sabaoth has thus ended, and the ruler of Babel is now known either as the High Prince or High Princess. While Ashdod is a monarchy, governance is far more complex, involving alliances with various warlords and merchants who lead countless factions. Even Babel itself is home to regular warfare to the point where it is simply accepted as the norm of life. 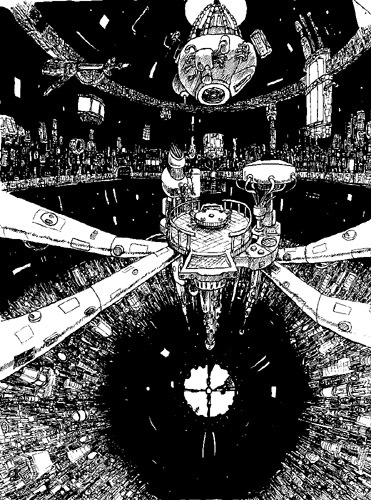 Babel was once home to one of the three primary Guild Halls of the Collegia Esoterica, but it was destroyed on New Year's Eve at the advent of the year 6100 RTR by a renegade Rephidimite captain who dropped a "Boomer" weapon on the city. Saskanar and Zahirinee were once part of the Ashdod Territories, but have since seceded and are independent states. Ashtoreth is a green planet that is a neighbor of Sinai, the fourth planet from the sun. It is associated with the element of Water and hence is of special importance to the Sphere of Water of the College Esoterica. The Kampfzengruppe/Emirate Alliance has established a base on Ashtoreth, at a place called Gateway Island. The planet is reported to be almost entirely covered with water, save for ice caps on the poles, and scattered islands. Storms frequently sweep the planet, sometimes causing Gateway Island to be completely covered in water. Out of necessity, the base on Gateway Island is underwater. Limited contact has been made with the "natives" -- a species of "mer-cats" with Khatta-like features, but lower bodies resembling the tails of dolphins or porpoises. Ashtoreth has one moon. The native name for it is unpronuncable in Sinaian tongues, and roughly translates to "the moon". 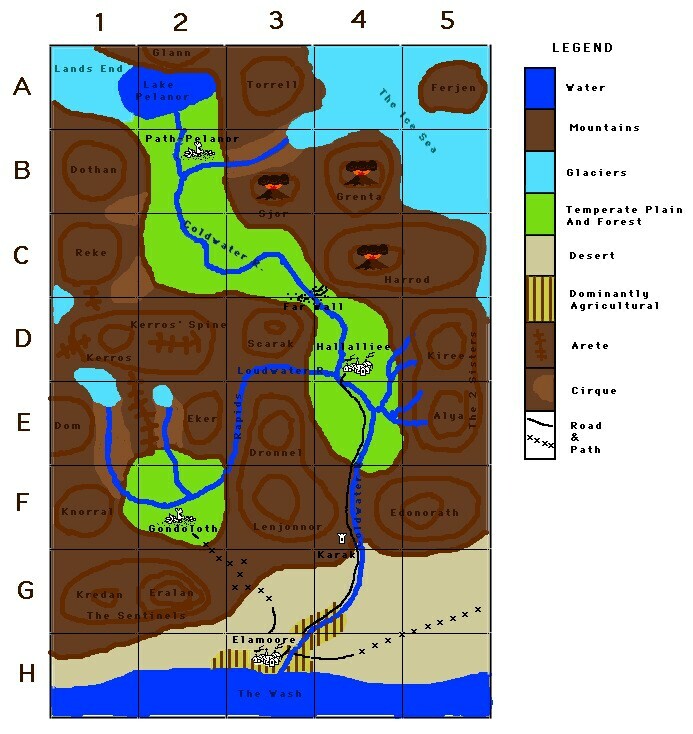 A major river of the continent of Ur, running along the western borders of the Hekoye Nation and the Forbidden Zone of Shabar, ending in the Stygian Sea. This river's name literally means "strange looking", and is tied to the Hekoye name for Shabar. Refers to both the capitol city of Ashdod, as well as the great tower which dominates the cityscape. This city, dominated by the bat-like Eeee, is a major center of trade and political power in Ashdod on the continent of Ur. It is built in a wide valley in the Golan Mountains, a short flight from the ocean. The city is truly ancient, records indicating that it was founded millenia ago, and new buildings have been repeatedly built upon the ruins of others, to the point where the metropolis consists now of towering spires and ziggurats, interconnected by stone bridges and aqueducts to bear water from the mountain peaks. The largest structure by far is the Great Tower, Babel, which is forever under construction. It is a measure of a ruler's power how much he can add to the tower's girth and height, and over time it has expanded outward to consume older portions of the city. Officially, no one actually lives in the Tower. It is a structure of religious (and political) significance, and a statement of the power and age of the Ashdodite civilization. Many of the battles fought in Babel are between warring construction crew factions, over matters of building and resources to be used. Babel is sometimes known as the "City of Strife", for "gang wars" are commonplace, especially in the shadowed and ruinous "Streets Below" in the forgotten lower levels that have been built upon with each succeeding generation. For millenia, the ruler of Babel (and, by extension, the ruler of Ashdod, at least in title), was known as the Sabaoth, which means "Almighty". After the War of the Plaguebringers, in which Babel was soundly defeated during a raid on Rephidim, the Sabaoth's reign ended, and he was succeeded by the first High Prince of Babel, Boghaz bar Sabaoth. One of the Seven Sisters, major goddesses of the Babelite pantheon. Although the exact "birth order" of the Seven Sisters is in question, Barada is traditionally held to be the youngest of the seven, though this doesn't exempt her from her fair share of bloodshed and mayhem. She is the matron of spies and seers, but also of those keeping secrets ... so she's also seen as a matron of thieves, at times, and she's also been strongly associated with wealth. Supplication is made to Barada in hopes that she will reveal secrets ... or make sure that they are kept. Businessmen often seek her blessing on their businesses ... or protection from thieves. Barada is a bit of a mischief-maker, sometimes choosing to reveal an otherwise perfectly-kept secret, just for the sake of stirring things up. Thus, when there is an unexplained "leak" of information, it is common to blame Barada's trouble-making. It is believed by many that the priestesses of Barada controlled a vast spy network that (for the most part) served the Sabaoth of Babel, mostly for the purpose of keeping tabs on the Houses of Babel and their activities. Mount Barada is also a location outside Babel, where there is a shrine built to the goddess of the same name. The rune representing Barada in Babelite script is also known as the "Golden Key". While there are no doubt many bazaars to be found on Sinai, the most famous and the most worthy of being called "The Bazaar" would be that of Rephidim. This is an unorganized sprawl of streetside booths and tents in an area of the city officially designated for "future expansion", but which sees use nonetheless as long as the proper bribes are made for officials to look the other way. Even so, the Temple generally has a presence in the form of guards to keep the peace ... as tempers flare often in the Bazaar, as a result of overly heated arguments over the value of a product, and accusations of trickery. For the most part, though, the Bazaar has a colorful, carnival atmosphere, and quite a share of street entertainers who work for a few shekels to be tossed in an upturned basket or hat. Even the noblesse can be seen at the Bazaar, to obtain rare and unusual imports, or just to see the sights. The Bazaar is best known for its everchanging nature, as booths tend to get put up or torn down daily, and a significant portion of the shopkeepers are the erratic and highly motivated Kavi. However, there are also a few more permanent storefronts, set up in old ruined buildings, serving as both residences and businesses, since there are no zoning laws to speak of in this area. The most noteworthy landmark of the Bazaar is the Clock Tower, visible from most any part of the area. The architecture of the Bazaar is greatly varied, a result of ages of being built and rebuilt, falling into ruin, then being modified to suit the needs of those who have reclaimed it in recent times for the purpose of making sales. There are buildings built upon buildings, and bridges that span streets and connect upper levels together, turning the Bazaar into a confusing maze in some quarters, best navigated by those with guides - or with wings. Many of the storefronts tend to "ghettoize", as evidenced by "Little Babel" - a cluster of stores and booths catering to Eeee clientele, which tends to move about the Bazaar any given day. The "Beast Lands" are a wilderness of scrub and warpwood trees under the canopy of a Forbidden Zone in the Desolate Band of the Savan Territories. Of little importance in the greater scheme of things, they are not widely known of outside of the Savan, merely another Forbidden Zone for airship captains to avoid. But to those who live near, the Beast Lands are a place viewed with fear and dread, said to be an accursed ground where not only technology but magic becomes dangerous to try to use. Furthermore, it is said that children born in the Beast Lands will be born with the minds of savage beasts, lacking even the refinement of many nonsapient predators. Tales are told of cannibalistic, mindless savages that prey upon the unwary who wander too far into this vaguely defined zone ... and of cruel pirates who are bold enough to use this land to hide their base of operations. Behemoth is the ninth and last known planet of the solar system, and also the largest. It appears to be mostly orange, though it requires powerful telescopic equipment to have a fair chance at even seeing it. It has several moons, and was long believed to be made of solid rock. It is strongly associated with the element of Earth and hence is of special importance to the Sphere of Earth (Earth, Sphere of) of the College Esoterica. Access has been made possible by the Gateway Tower, and scouts have reported that Behemoth is actually a gaseous giant surrounded by a sparse "cage" formed by a network of mind-bogglingly long tunnels fashioned of stone and Sifran crystal. The tunnels themselves somehow support an atmosphere and gravity comparable to that of the surface of Sinai. Levels of Quantum Uncertainty are such that neither magic nor sophisticated technology is known to work here. In the Olympian Pantheon, Behemoth is also the name of a god of earth, the mountains, of metal-working, and of strength, depicted as a huge and muscular Kattha. Sky island serving as site of College Esoterica since New Year's Day 8, 6100 RTR. The sky island was barely habitable, but of large size, and follows erratic movements all around the globe of Sinai. After the catastrophic events that led to large scale devastation of the Collegia Esoterica on the surface (including the utter destruction of the Guild Hall in Babel) and attacks upon the College in Rephidim, the leadership of the Collegia decided to move to neutral territory, and to reaffirm the College's status as being outside of political boundaries (even though its individual members work for the various powers of Sinai). The sky island of Caroban moves erratically about the globe, making it difficult to find except for those with magical powers - or those who meet up with it at prescribed points, as Chaos Mages and Seers occasionally predict its movements and make this knowledge available for those who would visit to seek the College's services. The island itself is devoted to the College, a significant portion taken up by classroom buildings, laboratories, offices and dormitories, though there are also some open grounds (primarily for practice), and a small area devoted to living quarters for the support staff. There are also guest rooms for visiting alumni who occasionally have business on Caroban, distributed amongst the grounds of the various Spheres. A technologically advanced nation on the continent of Ai in the region of Nordika, bordered by Bosch on the south, Gallis and Sylvania on the west, Titania on the east, and the Vykarin Wastes to the north. Chronotopia has trade with Rephidim, but, largely due to constant warfare with the primarily lupine Titanians and barbarian tribes of Vykarins, canines and lupines tend to face certain prejudice within Chronotopian borders. Slavery is illegal in Chronotopia, and for a long time, Savanites were simply not permitted, as the leadership did not want to become a haven for runaway slaves and possibly spark conflict with the major powers of Sinai. However, with the recognition of Xenea, the collapse of the Nagai Empire, and the end of slavery in Rephidim, this policy has been rescinded. Nagai and many other beings more often found in warmer climates are fairly rare in this area, given its northern location, but otherwise the nation has a fairly diverse mix of races - primarily human, Korv, Cervani, Rhian, and a strain of black Khatta. Despite this, it has a tendency to display xenophobia and even a bit of fascism at times in its dealings with outsiders. While Chronotopia relies heavily on machinery and showcases myriads of great clock towers, it is no more advanced than steam power, and even that is highly unreliable due to quantum uncertainties on the surface of the planet. In recent years, though, significant advances have been made, especially with the advent of contact with civilizations on Abaddon and the greater availability of Abaddonian iron. The language of Chronotopia is Bosch (oddly enough, the same name as Chronotopia's worst enemy, the Forbidden Zone to the south) although Rephidim Standard is in wide usage. For ages, the City of Hands seemed to exist only in legend, a ruined city located somewhere in the Xenean jungles, overflowing with gems, but haunted by ghoulish spectres and strange phenomena where magic runs wild or is suppressed entirely. One particularly colorful notion about the city was that the buildings themselves are alive, able to sprout hands to catch the unwary, and that the buildings themselves could speak, telling secrets of old. Eventually, the actual City of Hands was discovered by an expedition sponsored by the Rephidim Temple, but it was believed to be destroyed later. For a time, it served as a secret haven for escaped Savanite slaves, ruled over by a mutant leader alternately known as Third-Vision, Third-Eye, or Jezebel. Eventually, the City of Hands no longer maintained its secrecy, and openly proclaimed its existence as a place for free Savanites, but it was overrun in 6099 RTR by the forces of the Nagai Empire, and destroyed. In recent years, there have been attempts by the people of the newly formed independent state of Xenea to restore the City of Hands, though not necessarily to inhabit it again. Replicas of some of the more noteworthy structures of the City of Hands can be found in the port city of Safar, in the theme park known as Safarland. Based on the sky island of Caroban, the College Esoterica is a center for organized magical study on Sinai, dividing the arts of Sinai magic into various "spheres" in which wizards specialize. To be a spellcaster without sanction by the College Esoterica on Sinai is to invite trouble, as the College jealously guards its position as the keeper of the secrets of the mystical arts. See also: Air, Sphere of; Earth, Sphere of; Fire, Sphere of; Water, Sphere of; Light, Sphere of; Shadow, Sphere of; Mind, Sphere of; Dream, Sphere of; Chaos, Sphere of; Life, Sphere of; Spirit, Sphere of; Illusion, Sphere of. "Dagh" is a common curse word with origins that the average user of the name is not in the least bit aware of. The true origins have been lost to time, but "Dagh" figures into many legends as a "dark god" or "lord of the underworld", and generally as a very powerful and malignant entity. Some legends describe Dagh as a very powerful (and evil) wizard from a time in history closer to the Expedition, during the age that magic was supposedly first discovered on Sinai. "Dagh" also figures into colorful phrases and exclamations such as "Dagh's dentures!" or names of forboding locations, or strange rock formations, such as "Dagh's Tower". Somewhat controversially, Dagh is also recognized as the name of a recently discovered eleventh planet in the Primus System, associated with the Sphere of Illusion (Illusion, Sphere of). However, an explorer dubbed the planet "Quicksilver", and since this name is not considered a foul word in any known language or culture, it is often used as an alternate name for the world. Presently, little is known of this planet, save that it is accessible through the Gateway Tower and that it appears to be a reflective orb. Darkside is the name given to the shadier portion of Rephidim, where law enforcement is practically nonexistent, and all sorts of crime and vices can be found. While Darkside is ostensibly under the authority of the Temple, in reality it is nearly autonomous. For a time, it was in effect ruled by a crime lord known as "Faraon the Friend" - a golden dragon that resided in the Jade Palace (also known as "Faraon's Dome"), in Underside - the flip side of Rephidim. However, a concerted military assault following the kidnapping of the Captain-Astromancer resulted in the destruction of Faraon's base of power, and forced his flight from Rephidim. Now, it seems that Darkside's crime organizations are crushed, divided into petty factions squabbling over territory, since Faraon had succeeded in crushing the other major power years before - the Assassins' Guild. The Desolate Band is a name given to a strip that runs from coast to coast across the northern midsection of the Savan Territories, along the equator, marked by expanses of desert and near-desert, occasionally broken by clusters of life to be found along the scarce rivers. There are sub-regions which have their boundaries within this expanse, but they are generally of little import to the outside world. Officially, the Desolate Band was once part of the Nagai Empire, though it never had much physical presence at all there. In addition to the harsh climate, the Desolate Band is also well known for the various types of non-sapient reptiles that roam this region, many reaching legendary sizes (and degrees of ferocity). Fortunately, they're also known for being incredibly stupid. One of the innermost and secret areas of the Technopriesthood in Rephidim Temple, the Diagnostitorium is used for special high rituals of arcane nature. Mount Dronnel is a very large mountain located near the city-state of Babel in the Ashdod Territories on the continent of Ur. It is home to a wide variety of plants that yield roots and herbs that serve as components for many healing unguents ... and for several quack recipes as well. It holds a significant position in the mythology of Babel and in Eeee culture abroad, (The stories tend to be familiar even to Rephidim-born bats.) as many an arduous quest to the mountain despite hazardous weather has been required for some obscure component to a cure to aid an ailing hero, according to the tales. Some tales attribute the name of the mountain to being that of a great hero of old, but studies suggest that the recognized name (which is likely to have undergone change over the millenia) of the mountain may predate such legends. Until the cataclysm that reshaped the Himar territories, the city of Elamoore was the primary trading center of this region. It was once built on the Coldwater River, in concentric circles that divided the city into segments. Innermost was the Marketplace, encircled by the wealthy quarter. That in turn was surrounded by the city walls, just outside of which could be found the middle-class ring. Around this was a canal which separated it from the "Squatter" ring and outlying farms. Presently, Elamoore has been replaced by a large quantity of red rock, part of the Red Cliffs, and the Coldwater River has been diverted, flowing around the base of the plateau. The actual city of Elamoore was discovered to be displaced to the planet of Abaddon, where it remains in the center of the Pit of Himar. Back in Himar, a new settlement has sprung up, known as New Elamoore, though it is only a shadow of its predecessor, and is dominated by the Khattan Emirate. Once the seat of power of the country of Stalwirland, the castle of Falcon's Watch is now but a ruin, and not much better than the town by the same name that it overlooks. Located in the mountainous fiefdom of Xanashire, near Half Valley on the continent of Ai, this was once home to the kings of the line of Xante, before the War of the Vassals destroyed the minor kingdom. Capitol of the nation of Gallis, in Nordika, in the northern part of the continent of Ai. The Marquis of the city of Fauxpas is the de-facto ruler of all Gallis (though Gallis does not formally have anyone who holds the title of "king" or the equivalent). An apparently new sky island that was first spotted over the frigid Vykarin Wastes of Nordika, in the northern part of the continent of Ai, of size smaller than Rephidim, but still substantial. Like Rephidim, this sky island possesses its own regulated air pressure and temperature, acting as a "permanent weather front", affecting the weather of lands it passes over. It is notable for having a mostly flat surface, save for a large plateau-like mountain in the center with a bowl-shaped valley in its center, filled with various types of vegetation. In recent years, the Order of the Bounded Star and Anchor - the Knight Templar order - has moved its base of operations to this sky island, in a schism with the hierarchy of the Rephidim Temple, from its former base of operations at Golgotha. Fetiss Sky Island is generally attributed as being discovered by the controversial explorer, Bassai of Nijushiho Institute, which prompted him to be granted an even more controversial boon by the Nagai Emperor-Potentate. It has later been revealed that a confrontation occurred between a Knight Templar of the Magenta Lance, Thorn, and Bassai, as the Knight Templar had placed a flag claiming the island for the Rephidim Temple. 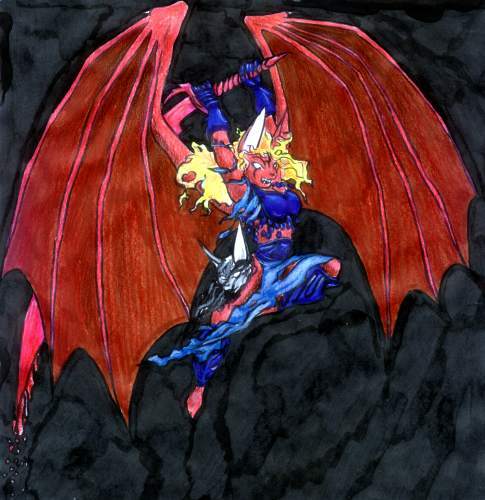 While the Templar's back was turned, a Nagai doctor accompanying Bassai, by the name of Fetiss, attacked the Templar, biting her neck through a gap in her armor. In the end, both Lancer and Naga died, and Bassai covered up the incident, reporting that they had both been killed by Babelite forces, and having the island named after the deceased Fetiss. Fleaufille is a major city in the Nordikan country of Gallis, known for its grand museums, monuments, ballrooms, sculpted gardens, and other sights and sites. For wealthy sight-seers, this is the place to visit in Gallis. It also houses Revolution Park, a square that has enshrined within it a metal-bladed guillotine which figured prominently in the last revolution (Gallis has several), surrounded by neoclassical statues of rulers of times past ... minus their heads. Scattered across Sinai are regions known as the Forbidden Zones, so named because no sane airship captain would ever steer his vessel into this area. Those who venture in fall victim to mysterious accidents. The "Zones" are not immediately visible or special in any way from a distance ... but once one flies INTO such a zone, the scenery changes dramatically, as the sky darkens, webs of lightning spread about ... and things generally get unpleasant. On the ground, there isn't necessarily anything special at all ... except that the persons known as "Exiles", when they arrive on Sinai, show up somewhere within these Zones, by some mysterious means. Forbidden Zones vary greatly in size, some of the more noteworthy (and especially large) ones including Shabar, Aeztepa, Bosch, the Forbidden Zone of Mount Dronnel, and Xenea Canyon (site of the City of Hands). Other Zones have been discovered, among other places, in the Vykarin Wastes, the Wandering Roams, the Himaat, Himar, and the Desolate Band. Fortunatis is officially considered the sixth planet from the sun, although in truth its orbit is highly irregular, thus throwing off attempts at accurately assigning numeric positions to the nine known planets of the solar system. Its appearance changes wildly as well, in color and (if one has rare telescopic equipment), surface pattern, as viewed from Sinai. The planet is strongly associated with matters of luck and fate and is a factor in all sorts of popular attempts at telling portents of the future. Its "official" name changes regularly, as determined by the Sphere of Chaos (Chaos, Sphere of), to which it has special meaning. However, since the average citizen isn't able to or interested in keeping up with these seemingly random name changes, it is commonly known as "Fortunatis". Fortunatis is also one of many names for the god of luck (good and ill) and wealth, in the Olympian Pantheon. Fortunatis is often depicted as a "trickster god", though in myth he seems to compete with Ariel for this role. Gallis is a country located in the region known as Nordika, on the northern part of the continent of Ai. It touches the southern part of the western border of Chronotopia, and is bordered on the north by the wilderness land of Sylvania. Its eastern borders touches the fringes of the mountains that border the Forbidden Zone of Bosch as well, though it has far less contact with that realm than Chronotopia. While Rephidim Standard is in use in some areas, Gallisian is the language of choice here. This is the former headquarters for the Knights Templar, who were once considered to be the elite warriors of Rephidim Temple. It consists of a main fortification cut into the base of Rephidim's central mountain, on the side opposite the city, and is surrounded by what once served as training grounds and a number of other buildings known as Sanctuaries -- symbolic bases for the various Lances of the different Aspects of the Order of the Bounded Star and Anchor. Little is known of what is inside the fortification, but it is said that the main chamber is dominated by a glowing pool of fire, and that the walls sport randomly placed stained glass windows bearing the crests of all of the Aspects ever created for the Order. Now, Golgotha is still used as training grounds for use by the Order, but its base of operations has moved to the sky island of Fetiss, after a schism with the Rephidim Temple. Gorphat is the Goddess of Affliction, and is displayed as a gaunt, thin woman, and is typically portrayed in myth as being very lazy and slothful - a trait often exploited by her sisters to their advantage. While her realm is primarily disease, she is also often associated with famine and pestilence as well. Sacrifices are made to her in hopes of staving off disease, or in the hopes of bringing it to the households of enemies. Due to the habit of her priestesses of conducting Purges in the Undercity, she is also associated with the Sphere of Fire (Fire, Sphere of) in some myths. Gorphat is also the name of a mountain outside of Babel, where a shrine to the goddess of the same name is located. Some of the priestesses practice magic of a sub-set of the Sphere of Life (Life, Sphere of), focusing on the aspect of Disease. The rune that represents Gorphat in Babelite script is known as "The Wound", and it also frequently used as a symbol for Life Magic focusing on the aspect of Disease. A town located near the mouth of the Levitha River, on the west side of the Seaborne Reach Peninsula on the continent of Ai. While this is nothing more than a village, it's the largest and most stable settlement in the immediate region, and it is popular amongst wealthy hunters who seek to bag game on the nearby island of Levitha's Pearl. The name of "Half Valley" is also used at times to refer to the general region in which the village is situated. One noteworthy feature of the weather of the area is what has been called "Levitha's Shroud" -- a thick fog that rolls in to blanket the valley on a regular basis. The Pearl, also called "The Basin", is another mysterious feature of the area, populated by wildly mutated (and often overgrown) beasts. Large lake in Titania. According to legend, a Titanian lost his hammer in the lake, and thereafter when he was asked where his hammer was, he would point at the lake and say, "There's my hammer!" And so it came to be known as Hammer Lake. The Hekoye Nation is an expanse located on the equatorial part of the continent of Ur, bordered to the west by the Assokinaqot River, to the south by the Forbidden Zone of Shabar, and to the east by the Ashdod Territories. Since this is an equatorial nation, it tends to be fairly warm year-round, though there are also some mountainous regions within its expanse. The "capitol" of the Hekoye Nation is Ihtoli Maqahamok, a meeting place located up in the mountains, and not claimed by any one of the tribes. Himaat is a mostly desert territory (interchangeable with reference to the Himaat Desert or just "The Himaat") bordered by the west by the Sea of Himaat, touched by Himar and Tizhar to the north, and bordering the Savan to the south. It is noteworthy for the "Sea of Sand", a vast expanse of very fine, light sand that behaves much like quicksand, and is home to a few varieties of creatures which "swim" through it ... or "sail" over it. The largest city of Himaat is Abu Dhabi, a port city located on the shore of the Sea of Himaat, and the capitol of the Khattan Emirate. Another settlement of note is the town of Gateway, built up around the Gateway Tower. Less visited is the near-legendary city of Noh, home to a large settlement of the reclusive and mutated Nohbakim, and the mysterious Earth Tower, also known as the Tower of Barabbas. Also known as the "Himar Territories". Sometimes confused with the region of Himaat, which has sometimes been supposed to be part of the "Himar Territories" in ancient times - a notion that still shows up at times in the present. The capitol of Himar is New Elamoore, a settlement located close to the Red Cliffs - a large red plateau formed of Abaddonian earth transplanted to Sinai when the "Boomer" was dropped by Babel on the city of Elamoore. Due to the devastation wrought by this ordeal, Himar has fallen under the influence of the Khattan Emirate, and is now part of the Emir's considerable empire. Himar is frequently underneath or close to the path of the movements of the sky island of Rephidim, and therefore has frequent dealings with it. There is no particular "dominant species" in Himar, as a wide number of species can be found there, especially in the vicinity of Elamoore. Most associated with Himar are Himarian Jupani (Jupani, Himarian), also known as "Feral Jupani". There are also some fauna associated with Himar, such as the gooshurm and the graker, but non-anthropomorphic "Terran" type animals are fairly common in the wilderness areas here. "Capitol" of the Hekoye Nation -- in actuality, a sacred meeting ground located on a mountaintop, chosen because it is on ground that (at least at the time) would not be coveted by any of the tribes, and therefore could be considered neutral and uncontested ground. It is not home to any true settlement, though there are some among the Hekoye who can be found in the area, seeing to it that the sacred grounds are not defiled by outsiders. In Olympian legend, Ikara was a female Solus or else a Kattha who had bargained with a mage to gain wings, who had become obsessed with the Sun God Primus, and failed to gain his notice - for he was a god, and she a mere mortal. She flew so high, chasing after the Sun God in his flaming sky-ship, that she drew too close and caught aflame, plummeting to the ground. In later, more popular versions of the tale, the gods had mercy on Ikara and raised her from the ashes anew, and she now can be seen on occasion, chasing after the sun, observed as a phenomenon known in other cultures as a "sun dog". Thus, she is often associated with the imagery of rebirth and of the phoenix. Also the name of a town in Olympia, where a shrine has been built to Ikara next to a small temple of Primus. There, Ikara is revered as a goddess, albiet not of the original pantheon. Inala is the most popular of the Seven Sisters, and portrayed as the most beautiful of the group, and is generally regarded as being the oldest. She is a complete hedonist, and myths featuring her are the least suitable reading for impressionable minds. She is sometimes presented as a "Goddess of Love" for the benefit of outsiders, but such sugar-coating does little justice to how she is portrayed in myth. Quite often, it involves some mortal catching her attentions, and she "blesses" this mortal with all manner of gifts ... and then ends up destroying the mortal in the end. So many Babelites apparently still see this as a great way to go, and Inala is the one goddess of the Seven Sisters most truly worshipped rather than merely appeased. Inala is also the name of a mountain just outside of Babel, and home to a "shrine" to the goddess of the same name -- in practice, a brothel where all manner of vices are performed, many of them quite unspeakable. The "Children of Inala" are priests and priestesses born and bred into the service of this goddess, and cannot leave the priesthood except by death. It is a whispered rumor that those who are born to the "Children" who are ugly or deformed in any way are offered up as sacrifices. Those who are not "perfect" but still "usable" are sold off to the various Houses as child servants. The rune that represents Inala in Babelite script is also known as "The Flower". Jadai is an island located off the east coast of the Savan Territories, near Nagai City, and formerly part of the Nagai Empire. Jadai is considered part of the Savan, and is therefore the easternmost portion of the Savan, though not connected to the mainland. Jadai is dominated by and mostly populated by Kirigai. The capitol city of Jashin, located on the western side of the island, and thus closer to Nagai City, is also the location of the major port of the island. Also once known as "Faraon's Dome", this is a large roughly spherical structure built into the side of the main "stalactite" hanging from the bottom of Rephidim, and is the largest structure in Underside. It was once an exclusive resort catering to the rich and powerful, and also the base of operations of a dragon crime lord known as "Faraon the Friend", until his ouster by Rephidim Temple forces led by Arch-Inquisitrix Esther yodh Rahab. It is home to a self-contained artificial environment, replete with gardens and waterfalls, and luminescent varieties of plant life. In the aftermath of Faraon's defeat in 6104 RTR, it is presently in the hands of the Rephidim Temple. Capitol city of the island territory of Jadai, formerly part of the Nagai Empire. Jashin was once dominated by the Nagai, but is now dominated by Kiriga rulers, since it is mostly populated by Kirigai. It is a major port city for the island as well, and its location between the continents of Ur and Lamu make it a frequent stopping point for ships making the journey between those two continents, whether by air or by sea. Lake on the northern border of the Himaat. Also known as the "Lake of Bones", named after all of those who have died while seeking its waters across the desert, and those who have died drinking the water. There are many places in the lake where there are high concentrations of harmful bacteria, and it's best to boil the water before drinking it. Despite this, the lake marks the edge of the Himaat Desert, and the start of vegetated areas toward the north. The Khattan Emirate refers to the domains of the Emir. Due to the nomadic nature of many of the peoples of the Emirate, this domain has no well-defined borders, and was long considered to correspond to the loosely-defined borders of the Himaat. Indeed, the terms Himaat, Himaat Desert and the Khattan Emirate are often considered interchangeable by outsiders. However, in the fallout of the Alliance Wars, the Khattan Emirate - which chose to remain neutral in the conflict - has grown in prosperity and influence, in large part due to its alliance with the Kampfzengruppe of Abaddon, and its control over Sinai's Gateway Tower in the Himaat Desert. With the displacement of Elamoore, the Emir wielded considerable political and economic influence in neighboring Himar, to the point that Himar has now been annexed. The small area of Tizhar is considered to be under the influence of the Emirate as well, and the mountainous country of Kilmanjar is under the Emir's sway as well. The Khattan Emirate is dominated by the feline Khatta and Kattha races, though with a large presence of the Zerda people as well. Due to the alliance with the Kampfzengruppe of Abaddon, there are many humans that may be found in the domains of the Emirate now as well, and there is an especially diverse racial distribution in the annexed lands of Himar. While there are many Nohbakim nomads in the Himaat Desert, they are considered riff-raff, and not true and loyal subjects of the Emir. As various events have led to greater association between certain of the Nohbakim people and the outside world, however, this may be a changing factor. Kilmanjar is a mountainous region near the northern coasts of the Savan, densely vegetated with giant trees much as the Xenean Jungle, but in a much cooler climate. Due to the strong wind currents that thwart the attempts of airships to access the area, and the steep, treacherous slopes, the region is largely uninhabited, and fairly untouched by Rephidim-dominated civilization. With the collapse of the Nagai Empire, the Khattan Emirate has exerted considerable influence over this territory, freely moving in and out, and making use of its natural resources, though it has not been formally annexed as a territory. There are also settlements of Savanites here, though there are no definite "native races" or any political structure beyond village leadership. Obscure country in Nordika (on the northern part of the continent of Ai) located to the south of Bosch, to the southeast of Gallis, and to the west of Olympia. Kroz doesn't have many dealings with the rest of Sinai at large, so it isn't particularly well-known by outsiders. Kroz is divided into eight Principalities, each ruled by a Prince. Although legend speaks of Kroz once being ruled by a King, there is presently no single ruler of Kroz -- It is, in essence, eight smaller fiefdoms united only by geographic location, common culture, and name. The name of each Principality can change with the surname of the current Prince ruling it. At present, these Principalities (and the names of the Princes ruling them) are: Diamante, Cobalt, Stiletto, Naochi, Darklight, Urban, Silverbirch and Dack. The major races found in Kroz (Cervani, Skreek, Jupani, Skeek, Rath'ani, and Khatta/Kattha) tend to have a high incidence of genetic variance toward human-like characteristics in the form of human-like head hair, plantigrade leg stance, and a tendency toward a human range of height. There are also many Kavis to be found in Kroz, though they don't show any special genetic variation along these lines. Legends tell of an ancient kingdom known as Moltpaa, which used to exist underground in an area with the same borders as present-day Kroz. There are many monsters said to inhabit these ruins, along with many traps ... and many treasures. Thus, Kroz is sometimes a magnet for adventure-seekers. Lamu is the third-largest of the three major continents of Sinai, located in the southern hemisphere, close to the equator. The Lake of Langour is an inland sea located on the northern part of the continent of Ai. Regional legend holds that the "underworld" (the land of monsters and spirits) has a lake that matches the Lake of Langour in exact dimensions, and that the lake, therefore, exists both in the physical and spiritual realms. This is often used as an excuse to explain mysterious disappearances of fishing vessels that set out on the lake, though a more naturalistic explanation would be that there are sometimes freak storms that may catch a fishing vessel unawares, and Sinai is also known to have a number of seaborne hostile creatures that could present a risk to a small boat. The Pearl is an island just off of the west coast of the Seaborne Reach, in the Sea of Himaat. It is a large crater island that consists of an inner region known as the Basin, in which large and mutated beasts are known to roam (and serve as an attraction for big game hunters across the globe). This in turn is surrounded by the Rim, a rocky area that effectively walls in the Basin, and is home to a small "town" that provides access to and from the island. A loose collection of storefronts and booths in the Bazaar, catering to the tastes of Eeee, particularly those with origins in Ashdod or surrounding territories. Little Babel tends to move about the Bazaar from day to day, and since most of the clientele are able to fly, many of the "storefronts" are set up on rooftops. Edible bugs are frequently available in various forms. Logos is the eighth planet from the sun, a brown world that is not visible to the naked eye, but only with the help of powerful (and rare) telescopic equipment. It is associated with and important to the Sphere of Mind (Mind, Sphere of) of the College Esoterica. Since the advent of travel to other worlds by way of the Gateway Tower, it has been determined that Logos is a gaseous planet, and the Tower provides access to a satellite orbiting the planet (apparently built by the Sifras), rather than to the planet itself. Legendary underground kingdom of a bygone age, with borders supposedly matching that of present-day Kroz. Ruins can be found in the wilderness of Kroz, attributed to this ancient culture of a kingdom supposedly ruled by Skreeks. Some adventurers and treasure-hunters are drawn to Kroz in hopes of finding one of these entrances, and fighting off monsters and traps in order to retrieve ancient treasures, but the known entrances have pretty much been picked over by now. Morpheus is the second planet from the sun, appearing grey in color, when it can be seen, and also curious in that it always appears to be in the same "phase" of crescent. This is because, even though it is closer to the sun, somehow it is on the same plane of orbit as Sinai, and also has the same length of year, thus moving in concert with Sinai. It is associated with the realm of Dream and hence is of importance to the Sphere of Dream of the College Esoterica. In legend, Morpheus is also the name of the God of Dreams, without any specific form (though, due to the predominance of the Olympian mythos, traditionally portrayed as a grey-furred Kattha). However, there has been a recent rebirth of interest in the long-forgotten God of Dreams, as several Dream Mages have claimed to have seen Morpheus during their rituals. This God of Dreams is described as appearing as a dark silhouette in the shape of a winged Khatta with large ears. In recent years, the Gateway Tower provided access to the planet Morpheus. The Rephidim Temple began attempts to map the planet, but this was frustrated by its everchanging nature. Reports indicate that the planet has a breathable atmosphere despite having a low gravity that shouldn't be able to sustain it. Furthermore, it is covered in grey silt which drifts about in clouds, requiring some sort of air filter to be worn while on the planet. Strange structures of "molten crystal" and stone rise and fall on occasion, and sometimes defy gravity, while the air is filled with the quiet sounds of chiming melodies from time to time. Further exploration has been frustrated by a large crystal growth that formed about the Gateway Tower on Morpheus, effectively trapping it, and preventing exit from the Crystal Chamber there. The Moz Ezley Home for the Disturbed in Spirit is also known as "The Asylum". Located amongst the Old City ruins in deepest Darkside, here can be found tormented souls who are kept here ostensibly to keep them from harming themselves or others, though escapes are not all that infrequent. The term for the collective people known as "the Nagai", reptiloids that resemble snakes, but have semi-humanoid upper torsos, with two arms. Sometimes, the term is abused to refer to other, non-snake-like reptiloids often associated with the Nagai. Short for "Nagai Empire". Refers to the collection of territories with boundaries that equal that of the Savan Territories (with the exception that Fetiss Sky Island is considered part of the Nagai Empire, yet it is not part of the Savan). Major territory of the Nagai Empire, located on the east coast of the Savan Territories. Capitol city (more specifically known as Nagai City) of the Nagai Empire, located within the Nagai Territory, on the east side of the Savan Territories. A settlement that has sprung up near the Red Cliffs of Himar, comprised of displaced former citizens of Elamoore who returned en masse from Abaddon with the discovery of the Gateway Tower. Due to the devastation wrought on Himar by the dropping of the "Boomer", New Elamoore is economically and politically dominated by the Khattan Emirate of neighboring Himaat. Ruined city located on the eastern side of the Himaat Desert, reputed to be the home of the mutated scavengers known as the Nohbakim. The city's origins are unclear, as the location is far away from any known oases or rivers, suggesting that it may have been built in a time before the desert expanded to its current boundaries. Name referring to an area of land north of Himar, on the continent of Ai, encompassing several smaller countries and territories, with climates tending toward the cool to downright cold depending on the time of year and the latitude. Of these lands, the Vykarin Wastes form a border to the north, blending into the Wandering Roams to the north and east. Chronotopia's northern border touches that of the Vykarin Wastes, and it also has Titania bordering it on the east. 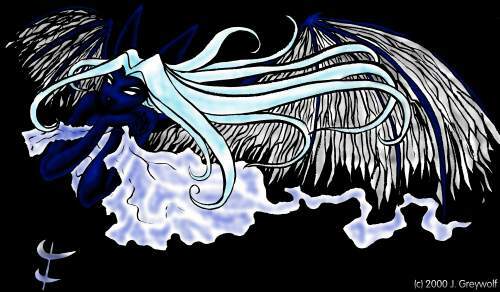 (Titania also borders the Vykarin Wastes.) Bosch is to the south of Chronotopia and Titania, bordering both lands in places, being located in a range of mountains that runs through both countries. The "Old City" on Rephidim refers to a ruinous area of Rephidim City that has long remained unpopulated ... except by the inhabitants of the Moz Ezley Home for the Disturbed in Spirit, and for drifters and squatters (the latter of whom are said not to remain there for very long in any case). The Old City -- especially the old graveyard -- is believed to be haunted, and even Darkside's most wicked elements tend to give the Old City a certain amount of berth. The Old Well is a long-standing structure in Darkside, and it was long a badly kept secret that it was one entrance to a network of underground tunnels known as the Warrens - kept guarded at all times. It was often a meeting place for those who wished to seek the services of the Assassins' Guild, so when Faraon the Friend wiped out the Assassins' Guild, he sealed up the Old Well as a symbol of his triumph. Nation on the surface of Sinai, in the Nordika Region, on the north side of the continent of Ai. Olympia is located to the south and east of Bosch, east of Kroz, south of Titania and the Wandering Roams, and northwest of the Lake of Langour. Its capitol city, Parthos, is located on the cliffs overlooking the Lake of Langour. Olympia would be a long-forgotten "backwater" surface country, except for two related factors. First of all, once upon a time, it was a very influential cultural center, to the point where, for a time, Olympian became a major trade language in the region, rivalling the use of Rephidim Standard. Parthos is held by some to be the "birthplace" of the "modern" understanding of how magic works. Second, Parthos is somewhat of a tourist attraction for the wealthy and well-travelled, since its scenic ruins harken back to a bygone era of glory and power. Olympia is dominated by Katthas, though it also has a large number of Khattas as well. Olympian is the official native language, but Rephidim Standard is also in wide usage -- especially in the capitol city of Parthos. 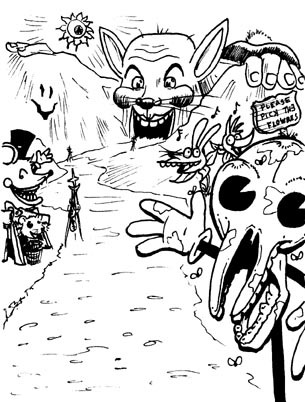 (Not common information outside of Nordika and Temple circles) The Sanctuary of Order, also known as the Sanctuary of Gears, is an oasis of reality and sanity in the Forbidden Zone region of Bosch, located near its western border with Gallis. A mountain pass road connects the Sanctuary with Gallis, and is the only means of ferrying in the supplies the Sanctuary depends upon -- and the pilgrims who occasionally visit (typically bringing donations and gifts for the pilgrims from afar -- the most prized being books to add to its many libraries). The structure itself would resemble a great gear, if it could be viewed from above, and is a well-fortified place, built on consecrated grounds, and defended by a dedicated order of monks and mages. The Bronze Lance of the Knights Templar of the Order of the Bounded Star and Anchor is based here, led by the Champion of Order (also known as the Champion of Gears). This is one of the three major equatorial oceans of Sinai, the others being the Abaddonian Ocean and the Stygian Sea. It is located between the continents of Ai and Lamu. 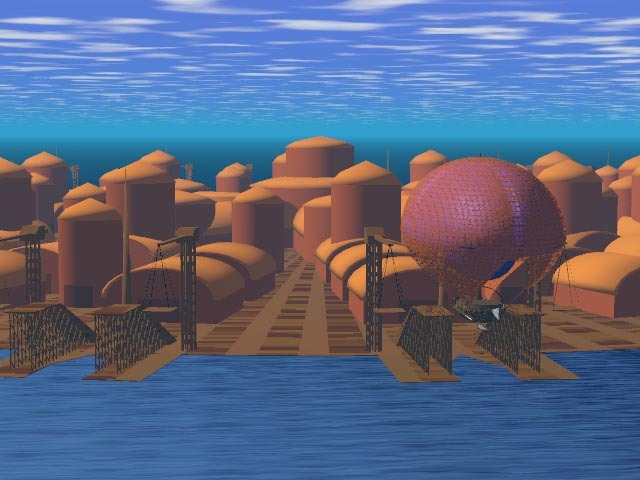 Paquebots are floating refueling stations on the ocean that are considered to be extensions of the nation that supports them. Examples would be "Little Rephidim West" and "Little Rephidim East", which lie along a route that crosses between the continents of Ai and Ur over the ocean. While paquebots may seem like little towns or sometimes even cities, they are quite rarely self-sufficient, relying upon incoming supplies (typically borne by water) which they can then relay to airships which simply can't carry that much weight on the long trans-continental journey. Paradys has long been legend among the Vartans, a sky island that would appear, then disappear into some Forbidden Zone, making pursuit impossible, supposedly made of gold and crystals and other shiny things. Thus, it was only natural that this should be the subject of the final quest of an old Vartan hero, Shokar, and the crew of his airship, "Shokar's Silver Bell". In very recent history, Paradys has been rediscovered, though it is still hard to reach, and it has been revealed that a Sphinx colony (half-Vartans who insist on calling themselves Vartans) has long been on there ... along with a colony of jaguar-morphs which, unfortunately, were almost entirely destroyed. A gargantuan coliseum built partially from a stone gorge, located in Nagai City in the Savan. This arena hosts the most attended games in the Nagai Empire, including the famed Annual Slitherball Championships. Pilgrims' Road is a path that cuts through a mountain pass from Gallis to the Sanctuary of Order, just into the edge of the Forbidden Zone of Bosch. This path is regularly patrolled by warrior-priests from a number of different sects who share a desire to combat the madness of Bosch -- While they can't drive back Bosch, they maintain a series of wards and shrines set along this road, which seem to be sufficient to hold at bay the bulk of the horrors of Bosch. However, safety cannot be guaranteed for travelers on this road, so the pilgrims who brave the horrors of Bosch to visit the Sanctuary of Order most often travel in large caravans. Pilgrims are warned not to stray from the path, despite the trickery that Bosch may throw at them: temptations, terrors, or attempts to cause confusion. The only solace is that, for whatever reason, Bosch cannot replicate the image of the Sanctuary of Order, nor of the wards and shrines that can be found along the path. For some, it is not the stay at the Sanctuary which is the true objective of the pilgrimage ... but rather the passing of the trials presented by the journey itself. Primus is one of the many names ascribed to the sun, a yellow star, of the solar system of which Sinai is a part. It is also the name of the rune associated with the Sphere of Light. Tenth planet of the Primus System, discovered by means of the Gateway Tower. 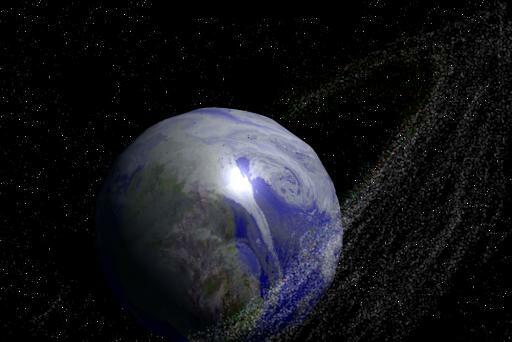 Dubbed "Quicksilver" by the Exile explorer, Envoy of Lothrhyn, in reference to the planet's appearance through the Gateway as a giant, spherical mirror, reflecting the stars. It has also been tentatively (and somewhat controversially) dubbed "Dagh" by some astronomers who insist on the tradition of naming the planets after obscure gods and goddesses of the Olympian pantheon. The Red Cliffs are a recently created geological feature in the Himar region, an after-effect of the strange device known as the Boomer, dropped on Elamoore by Babelite terrorists. As witnesses attest, Elamoore and its surrounding region simply vanished, replaced by a large chunk of red earth and rock. Trees, houses and other objects at the rim of this "replaced" area have been cleanly sliced right at the border, resulting in such phenomena as houses that have been halfway replaced by rock. The Red Cliffs form a high plateau that is nearly impossible to scale by most land-bound creatures without the assistance of airships. (Winged creatures, of course, have a distinct advantage.) Rumor has it that the top of the plateau is littered with huge chunks of ruined metal machinery, making this area a target of treasure-hunters from all over the globe. Rumor also has it that magic is suppressed or even nonexistent here, and that this may be a new Forbidden Zone. 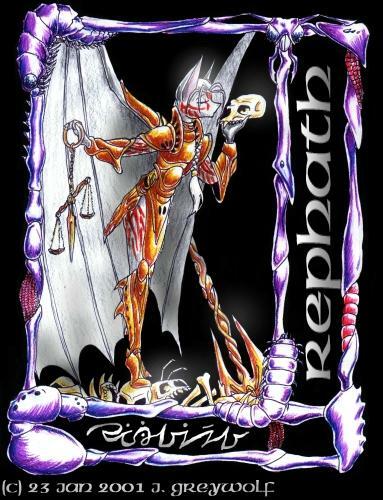 Rephath is the Goddess of Vengeance, one of the Seven Sisters of Babelite mythology. It is also the name of a mountain in a range ringing the city of Babel, the mountain being dedicated to the goddess of the same name, and having a shrine on it with her priestesses. Rephath is a matron of vigilantes, and myths involving her of course deal with matters of revenge, being routinely quite violent. At times, officials of Ashdod have attempted to portray Rephath in a more positive light as a matron of law enforcement officials, but this is only done by completely ignoring the particulars of established mythos. Rephath is traditionally depicted as a grey female Eeee - idealized as with most Babelite goddesses - with hair bound back in a long braid, and dyed markings in her fur, including variations upon her personal rune. She is often shown holding a set of scales, typically tipped to one side, and she is also often depicted with a large, double-bladed axe. The rune that represents Rephath in Babelite script is also known as "The Balance". The largest of the sky islands on Sinai is Rephidim, which houses a sizeable city of the same name. The city of Rephidim is dominated by a theo-bureaucracy based in the Temple, its emblem being that of the Star and Anchor. Rephidim is the most technologically advanced of any of the known Sinai cultures, largely due to the fact that magic is suppressed by approximately 75% (by most measures) here, and that technology is more reliable than down on the surface of the world. While Rephidim is a bustling city, it is also home to well-entrenched corruption and crime. The seediest portion of the city is referred to as Darkside, and is almost a city unto itself. At an altitude of 10,000 feet ASL, the air is thin and cold ... but due to a localized phenomenon, the atmosphere immediately around Rephidim is breathable and of a moderate temperature. In essence, the area around Rephidim is a permanent weather front, and its arrival as it meanders across Sinai is often heralded by storms on the surface. A major landmark of Gallis, located in the city of Fleaufille, is Revolution Square, which enshrines a guillotine (with a metal blade) responsible for the ends of the reigns of the last uncountable number of leaders of Gallis. It is seen as a symbol of freedom, the rising up of the oppressed against the oppressors, etc. Statues surround the guillotine, representing various former heads of state ... minus their heads, that is. The Sanctuary of Roses is based in Rephidim, among the Sanctuaries at Golgotha, at the base of the central mountain. It looks like a cross between fortification and greenhouse, and is the base of the Magenta Lance. It is not a tourist attraction by any means, due to its relative inaccessibility, but among florists, it is revered for having an impressive collection of roses of all known varieties found on Sinai, as well as several (believed to have been somehow brought in by Exiles or perhaps generated by magical means) not found elsewhere. A grassy territory of hills and plains located in the Ashdod Territories, under the authority of the city-state of Babel. Cultivated portions of the land are given over to farming and rughrat grazing -- There are no particularly large cities, as the world measures them, so this is a largely rural territory. Though Eeee nobility is ostensibly in charge of this territory, the majority of the sapient population is comprised of Fnerfs, and most of them are so far removed from urban life that they are hardly concerned with Babelite politics. A theme park located in Safar, the port city and capitol of the independent state of Xenea. This park is known for partially mechanical thrill rides and coasters, as well as themed environments and replicas of various sites - real and fictitious - of note on Sinai and even of the other worlds of the Primus System. It is also home to replicas of certain noteworthy structures from the destroyed City of Hands. Saskanar is one of the "Ashdod Territories", consisting mostly of plains and hilly areas west of Babel. Despite not being in one of the equatorial regions, there are many orchards and vineyards to be found in Saskanar, for which it is (modestly) famed among the Eeee. It is also home to some sub-strains of Eeee that subsist more on fruits than on insects. These particular Eeee are often known as "Saskanars" or "Saskanarians" or some unofficial variant because of the association. While it produces a great deal of fruit of the Ashdodites, it is not a particularly advanced region, nor is it very wealthy. The "Savan Territories" (also known as "The Savan") encompass a large equatorial region, almost a continent unto itself, on the southern half of the largest continent of Ai. Its heart consists of wide open plains, with a blighted streak across its middle known as the "Desolate Band", and is divided into numerous petty "kingdoms", but the whole of the area is largely dominated by the Nagai Empire, even if only by way of lip service. It is divided into several territories, including Kilmanjar, Xenea, Bromthen, Jadai and Nagai, and its major cities are Safar (in Xenea) and Nagai (in Nagai). While the Safar is typically associated with wild, deadly beasts (and just as deadly plants) and hot temperatures, some of the regions (especially in Kilmanjar) as just as capable of being quite cold. In all, it's a varied region, not surprising, given its sheer size. 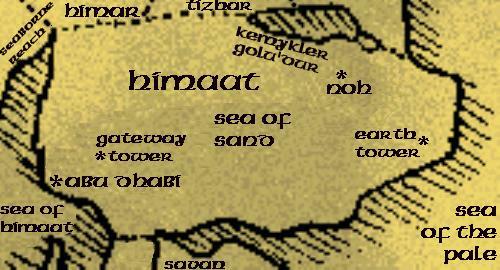 The Sea of Himaat is a large body of water located to the west of the sandy land of Himaat, north of the Savan, and south of the mass of land that includes Nordika, on the continent of Ai. The Seaborne Reach juts out into it, and Levitha's Pearl is an island of note in the Sea of Himaat. The coastal city of Abu Dhabi, capital of Himaat, lies along the east side of the sea. Another name for the "Northern Sea" or the "Vykarin Sea", a body of water in the Nordika Region, bordered by the Vykarin Wastes, Sylvania and Tursdi. This ocean, despite its location in the far north, is still home to many varieties of fish, including the carnivorous snark. The Seaborne Reach is a peninsula jutting out into the Sea of Himaat, west of Abu Dhabi. The peninsula is dominated by rocky ridges that land-lock any settlements, making travel by sea or air the most ready means of access ... and persistent bad weather on the inland greatly reduces the safety of the latter means. The largest settlements of note on the Seaborne Reach include the Akwani-kin Mangrove and Half Valley. It is also rumored that the kingdom of Stalwirland was once found in the mountainous regions. The largest river is the Levitha River, and on the west side of the Reach, at the mouth of this river, a crater island known as Levitha's Pearl is a major attraction for big game hunters from all over the globe. Blakat - Goddess of Murder. Matron of Mercenaries. Inala - Goddess of Pleasure. The most popular of the goddesses in Babelite culture. Sunala - Goddess of Death. Matron of Assassins. Rephath - Goddess of Vengeance. Matron of Vigilantes. Gorphat - Goddess of Disease. Zakaro - Goddess of Sorcery. Matron of Mages. Barada - Goddess of Secrets. Matron of Spies. Location - The "Seven Sisters" are also a range of mountains just outside of Babel, near Mount Dronnel. Each mountain is named after one of the Sisters, and has a shrine to that particular goddess, which is accessed by a winding path of broken red stone, flanked by fences on each side. Although Eeee are quite capable of flying, pilgrims are expected to walk the path up the mountain, for any other area not so designated is considered sacred. Exceptions are made for members of the priesthood and royalty, and military vessels are granted special sanction (with appropriate blessings) to be able to fly over the mountains if need be, in times of war. One unusual feature of Rephidim amongst most settlements on Sinai is that it has a working sewer system. In addition to the conveniences afforded by indoor plumbing, the sewer system is a necessity for recycling the limited water supply on the floating sky island. The mechanisms have been in place for time immemorial, and while there are sewer maintenance crews who attempt to battle clogs, the sewer has centuries (perhaps even millenia) of residue build-up, making it look more like a cavern than a man-made system in places. There are many vicious creatures and even criminal elements that make the sewers their home, or use it as an unconventional means of travel under the city. Nonetheless, the ancient machinery has proven to be durable and functional over all this time, a great testament to the ingenuity of the ancient engineers who built it. Shabar is a territory on the continent of Ur that corresponds to the area covered by a particularly large Forbidden Zone on the continent of Ur, to the west of Gigi and Ashdod. It is fairly unexplored, due to the fact that airships cannot safely enter, and in that nobody else can safely enter, either. Magic runs wild here, resulting in a fairly surreal landscape, described as being full of red rocky needles that rise up from the earth, piercing a glowing green sky that flows like liquid. Despite its hostile environment and the hostile creatures which roost in these spires, it is rumored that there is a monastery nestled far within the borders of this land, in which dwells a seer of visions and portents. Red moon of the planet Abaddon. Although devoid of any native plant life, Sheol has been reported to have a breathable atmosphere, another product of Sifran terraforming, since the planet is not large enough to sustain a gravity sufficient to keep an atmosphere of its own. Sheol is home to a moon base supported by the Abaddonians, fortified in recent years in an attempt to defend against an attack that was believed to be destined to come from the Silent Ones under the leadership of a heretical leader known as "Light-of-Star". Sheol is also the name of a lesser deity of the Olympian Pantheon, associated with death and ashes. Sinai is the fourth planet from the sun in the Primus System, and is close to being Earth-like in its variation of climates and its ability to sustain life. Sinai is slightly larger than Earth, for comparative purposes, but also somewhat lighter, due to a very low amount of heavy metals present. Sinai lacks a moon, though it is surrounded by a ring known to most Sinai-based cultures as the Procession ... and some theories hold that it may well be the remnant of a moon that was destroyed long ago by unknown forces. Among so many other odd features, Sinai is characterized by floating "sky island" structures, the largest of which is capable of sustaining Sinai's most powerful city, Rephidim. Magic is known and practiced on Sinai, and it is known that magical powers (and a phenomenon known as "quantum uncertainty) are stronger near the surface, but weaker up at the level of sky islands. They are sometimes even more powerful in certain regions, such as a Forbidden Zone. At the same time, where magic is more powerful, machinery -- especially more complex mechanisms -- tends to be less reliable. A wide variety of creatures can be found on Sinai, including many sapient races so varied as to defy organized classification -- particularly due to the high incidence of mutation on the surface, and the occasional arrival of Exile races from other worlds. Most of the surface is covered by oceans, but there are three major land mass groups: Ai, Ur and Lamu. The sky islands drift freely across the globe, following varying courses, most not bound to any particular continent or other geographical anchor. Loosely defined steppeland region located at the southwestern part of the Wandering Roams, located to the east of Bosch, and the north (and east) of Olympia. The only settlement here of note is the small "city" of Tsun-Lao, which houses a cluster of houses and marketplaces with which the wandering Sinha people do trade with the Olympians to the south. One of the more exotic features of Sinai is that there are several "islands" which float upon the air, borne by unknown means, following unpredictable routes across the sky which are not necessarily determined by the winds. The largest and best known of these is Rephidim, which, until recently, was the only one widely known to be populated. Other sky islands of note would include: Paradys, Tarsus and Fetiss. Although the sky islands tend to hover around 10,000 feet ASL, they sport localized phenomena that cancel out, to some degree, the very low air pressure that would be associated with such altitude. For this reason, the differences in air pressure often result in small atmospheric variances, such as clouds of mist which accompany the sky islands. There is much disagreement about what governs the movement of the sky islands. For all intents and purposes, it appears that they are random. However, the Captain-Astromancer has long been held to be able to predict the course of Rephidim's movements, and there have been whispers among some circles of some sort of connection between the movements of the sky islands and that of celestial bodies. Minor kingdom on the surface, once ruled by the line of Xante, south of the Nordika region, possibly near Half Valley on the Seaborne Reach. It fell into in-fighting a few generations ago, and even in its height had limited contact with the outside. It was reported to have limited use of technology or magic, and had no clearly dominant species in its population. According to legend, this was the site of the conflict between King Xante and Lord Calderas, in which the Compass Rose was rumored to have been called in to deal with a confrontation over the minor fiefdom of Gessershire -- and in which the Compass Rose also purportedly met its doom. Given the legends that have sprung up around the Compass Rose over the years, there are some who hold that the land of Stalwirland is fictitious. Some of the fiefdoms believed to make up Stalwirland included Gessershire, Xanashire (site of the king's estate, Falcon's Watch), and Tectishire. This is another term for the "Undercity" of Babel -- the lowest levels of the city that have long ago been built upon by the towers of this city, and so covered by intertwining stonework that many parts of them don't see daylight at all. The Streets Below have centuries and perhaps even millenia of accumulation of debris simply dropped from above, as well as rubble from the occasional collapse of structures, and it is said that the layer of debris is so thick that no one has ever actually set foot on ground in Babel for thousands of years. This area is inhabited by outcasts and criminal elements in Babel, and is a breeding ground for disease. For this reason, the Yodhgorphat (Daughters of Gorphat) take part in "purges by fire" of the Streets Below on occasion, having no regard for the loss of life that ensues amongst those unfortunate to be caught in the lowermost levels -- After all, the nobility and middle-class are high above this, and their stone towers are not in danger from the flames. The Stygian Sea is one of the three major equatorial oceans of Sinai, the other two being the Sea of the Pale and the Abaddonian Ocean. The Stygian Sea is the most frequently travelled of the oceans, located between the continents of Ai and Ur. There is a "paquebot bridge" consisting of Little Rephidim West and Little Rephidim East that marks the major route by sea or air between the two continents, as the paquebots are bases that supply vessels making the journey across the ocean. Sunala is the Goddess of Death, and a matron of assassins. She is believed to devour the souls of her prey, giving them utter annihilation rather than the afterlife. Nonetheless, sometimes condemned criminals or wounded soldiers will pray to her, begging her for a quick death, seeking annihilation rather than the horrible, slow deaths they expect to face. Despite her role, Sunala is depicted as a beautiful woman (by Babelite standards), with beauty rivaling that of her older sister, Inala. In Babelite myth, Sunala is the only goddess of the seven that is spared from ever being subjected to getting killed off at the hands of the others. It is suspected that if someone were to introduce a story that did portray Sunala as dying, he or she would receive a personal visit from some priestesses of Sunala intent on purging this "heresy". Sunala is also the name of a mountain located outside Babel, which houses a shrine to the goddess of the same name. It is not much of a secret that the priestesses of Sunala are often hired to perform ritualistic assassinations, though their services generally do not take them outside of Babel itself, and they never act against the ruling house of Babel (i.e., the Sabaoth, the High Prince, the High Princess, or whomever might hold the throne). The rune that represents Sunala in Babelite script is also known as "The Corpse". Sunrise City is the major known settlement on the continent of Lamu, located on the west coast. The name "city" is somewhat of a misnomer, compared to other major urban centers on the surface of Sinai, but it is the primary port of trade with airships and naval freighters. Sylvania is a country located in the northern part of the continent of Ai which is known collectively as Nordika. Sylvania touches the northern part of the western border of Chronotopia, and is bordered on the north by the Sea of Ice. Its southern border is shared with Gallis. As might be discerned from its name, Sylvania is full of forests, the bulk of its land still being untamed wilderness, though cultivated areas are dominated by farmlands. While most modern structures in Sylvania are wooden, it is known for its ancient castles, most of which are nothing but crumbling ruins today. Some decades ago, Sylvania was wracked by several disasters -- plaque, widespread fires, war and famine -- which decimated its population and crippled its ruling structures. Sylvania shares Chronotopia's knack for having particularly foul weather, with sunny days being the exception. Its scattered populace is dominated by Rhians, Korvs and a subrace of the Eeee. Scavengers and raiders occasionally present a problem to Gallis and Chronotopia, and its government seems to have very little ability to control its own people, so it is not on good terms with any of its neighbors. (Not common information) Tarsus is a habitable sky island claimed by Rephidim Temple, used as a storehouse and for other unadvertised purposes. Titania is a largely wilderness (not in the forested sense) region in Nordika, on the northern part of the continent of Ai. It is south of the Vykarin Wastes, and shares part of Chronotopia's eastern border, also touching the mountain ranges containing Bosch. "Titanians" are dominated by a wolf-like race (known as "Titanians", even if not all Titanians are lupines), plantigrade, typically very large and exceptionally resilient, with large "manes" and "fetlocks" on their forearms and legs. Titanians have no native tongue, per se, other than a badly mangled version of Rephidim Standard, but they do have "Hammersong", a violent form of Morse Code, so to speak. While Titanians are typically seen as barbaric and stupid, they are actually mechanically talented in some areas, constructing giant machines ... which are never given a way to shut off, since they usually do so themselves (violently). Titania is typically cold, with large patches of mostly barren (and crater-marked) land, marked by large networks of underground caverns. Nation located in the Himar Region, north of the Himaat and Kemykler Golu'dur, and east of Himar. This region is populated mostly by Khattas and Katthas, though it is also home to the coyote-like Hekoye. One major feature is the Tizhan Vastland, a Forbidden Zone that is the site of a great battle during a spill-over of the Necromantic Wars. This place is littered with bones and other remnants of the fallen, marked with craters ... and haunted by spirits of the dead. This is a place strong in magic of the Sphere of Spirit, and to be avoided by mortals. Port city located within the Sinh Range, part of the Wandering Roams, located to the east of Bosch and north of Olympia. Populated primarily by the feline species known as the Sinha, and is pretty much the only stationary settlement in the Sinh Range, given the nomadic tendencies of the Sinha. A vaguely defined region in the massive, upwardly-growing City of Babel, capitol of the Ashdod Territories. This encompasses the lower levels of streets, foundations and buildings that have been built up upon over centuries, a great deal of it having collapsed into rubble long ago. Over the ages, the Eeee, mimicking the age-long further construction of the Tower of Babel, have built new structures atop the old (sometimes resulting in terrible catastrophes as these structures collapse from time to time). Deep within the shadows of these spires are shadowed and forgotten streets, some of them little more than tunnels through stone and rubble, where the refuse of Babelite civilization gathers. Here, the light of day does not shine, nor is there any law and order. On occasion, the priestesses of Gorphat may conduct Purges of sections of the Undercity known to harbor large numbers of transients, but otherwise the people cowering here are left for the most part alone and forgotten. There are, of course, persistent rumors of treasures to be found in these depths, but also of monsters and other dangers as well. The "flip side" of Rephidim - or, that is, the bottom side - dominated by "stalactite"-like structures, and dwellings of flight-capable species. Rephidim Temple has long maintained little presence on Underside, but in the aftermath of the abduction of the Captain-Astromancer by "Faraon the Friend", this is no more. The largest structure of note is the Jade Palace (formerly known as Faraon's Dome), which once served as Faraon's base of operations, but it is now in the possession of the Rephidim Temple. A network of tunnels connecting with the Rephidim sewers provides a connection back to the top side, though fliers can of course just wing it around. Most of Underside is barren rock and crystal structures, but there are also large patches of kyootcumber vines and other vegetation clinging tenaciously to the stalactite-like structures. Ur is one of the three primary continents of Sinai, mostly situated in the northern hemisphere, though part of it crosses the equator. Its landmass includes the Ashdod Territories (including Babel and Saskanar), Aelfhem, the Gigi Coast and Shabar, in the northern part. A very large island, also considered part of Ur, known as Aeztepa, is at the very southern end. Wasteland territory of steppes and plains located on the eastern side of the Nordika Region on the north part of the continent of Ai. Many of these areas are pocked by large craters, presumably caused by the battles between giant goliath monsters (and the zaki bands that follow them). They also roamed by Xient and Hooka tribes, and possibly others. A network of tunnels underneath the area known as Darkside, consisting of long-forgotten maintenance accessways and natural formations, connecting with Rephidim's extensive underground sewer system. This was once used as a means for criminals to sneak about with near impunity, and even as a means of reaching the Underside of Rephidim, and the Jade Palace. However, due to increased incursions on the part of criminals during the bolder and last days of the reign of the crime lord Faraon the Friend, large sections of the Warrens were sealed off. Part of the Warrens were sealed off by Faraon himself, after he crushed his major opposition, the Assassins' Guild, symbolized by his sealing of the Old Well. Small fiefdom located on the Seaborne Reach, in a mountainous region, isolated from the surrounding areas. Its capitol is Falcon's Watch, a ruined castle with a small village at its base. Xenea is a territory of the Savan south and west of the mountains of Kilmanjar, and north of the Desolate Band. It is dominated by dense jungles filled with gigantic trees with canopies which all but block out the sun. The Bromthen Forest Hog is found in abundance here, along with Blood Flies and numerous other hostile creatures. Within a winding canyon on the Xenean River, the ancient City of Hands can be found, new home to the largest concentration of free Savanites to be found on Sinai. It was thought that the city was destroyed, but recent proclamations from the City have suggested otherwise. Since Xenea is under the jurisdiction of the Nagai Empire, this is a very controversial arrangement at best. The only outpost of civilization to be found in Xenea (other than the City of Hands) is Safar, which lies along the Xenean River (the largest in the region). Safar, until recently, was the center of trade of Savanite slaves. Now, its primary focus is on tourism, and catering to rich nobles who come out to hunt the wild animals of the jungle. Still, this is not enough to sustain Safar's economy, and it is in considerable decline. 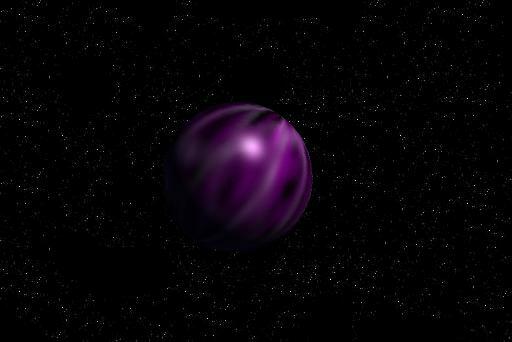 Eleventh planet of the Primus System, discovered by means of the Gateway Tower. Dubbed "Ylem" by the Exile explorer, Envoy of Lothrhyn, and, through the Gateway, appears to be a realm of swirling purple vapors. "Ylem" is an alien term for "the raw, unformed substance of the universe". This planet has also been tentatively dubbed "Kasaris", after the Olympian Goddess of Darkness, following the tradition of naming planets after the members of the Olympian pantheon. Zakaro is portrayed as a great mage amongst the Seven Sisters, even though they all exhibit miraculous powers as would be befitting to deities. She is associated with ancient, lost rituals ... but she is also seen as meddling in the spell-casting of mortals, causing spells to go awry when mortals displease her. As such, she may be reverred by Babelite mages, but offerings to her are more for the sake of appeasement and turning away her wrath than for seeking of any boons from her. Zakaro is also the name of a mountain outside of Babel, which holds a shrine deciated to the goddess of the same name. 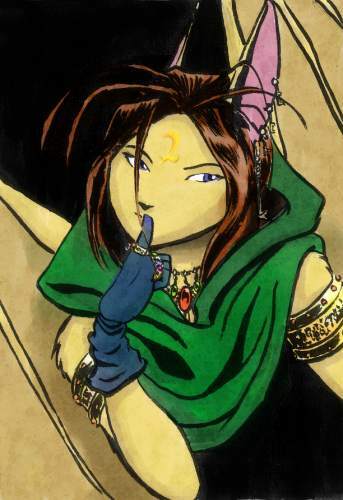 Many of the priestesses of Zakaro are mages, focusing on the Sphere of Chaos. For the most part, the priestesses of Zakaro do not have approval from the College Esoterica, but they have traditionally been protected by Babelite law for their roles as priestesses. The rune that represents Zakaro in Babelite script is also known as "The Magic Circle".